In recent years we have seen vast changes regarding masons' preferred choices of mortar for firebrick (fireplace) and clay flue liner (chimney) installations. Jobsite prepared mortars that may have included fireclay and Portland cement are now out of favor. Factory prepared refractory mortar is now the most widely accepted standard. Refractory mortars have become easier to use, safer, are more readily available, and meet all of the local and national building codes. Masons who resisted them at first now accept them as a better, safer masonry product offering their customers a higher quality installation. No more guesswork regarding homespun mortar formulations, liability issues, or concerns regarding code compliance. And without getting into all of the detail about the fireclay mixes breaking down and losing strength as they pass through the temperature range of 600-800 degrees, they simply don't take the heat like refractory mortars do, nor do they have the strength or acid resistance. While our building codes may have been a bit confusing or inconsistent in previous decades, that is no longer the case. The International Code Council (ICC), the International Residential Code (IRC) and the National Fire Protection Association (NFPA-211) now all require refractory mortar tested to American Society for Testing Materials, ASTM C-199, medium duty. Also called out in these codes are the high temperature resistant manufacturing standards for firebrick (ASTM C-27 & C-1261) and for clay flue lining (ASTM C-315). It does make sense that the mortars used for installation of firebrick and clay flues should be manufactured to a high temperature resistant standard as well. After all, what part of residential construction should have more attention to fire safety than that part which we are going to intentionally build a fire in? Buckley building a firebox. Click for a larger image. Non-water soluble refractory mortar is the only refractory mortar that should be used in outdoor applications. Premixed refractory mortars may wash out even after drying. Due to the previously mentioned characteristics, non-water soluble product is the preferred choice for clay flue installations that may vent gas or oil appliances or in any other instance where moisture may be present within the clay flue. This is our overall refractory mortar of choice. It is used four to one vs. other types of refractory mortar in residential construction. Premixed refractory mortar is a blend of clays, aggregates, and has a liquid silicate as a binder. Some masons prefer it simply because it is premixed, nothing needs to be added, and with a simple quick stir it is ready to use. Since the firebrick can be laid in place very rapidly (as with a firebox with firebrick joints 1/16" to 1/8" thick, for example) installation is a little quicker. Ten seconds after setting the firebrick it takes some effort to dislodge them and the fast drying of the mortar does not compromise its strength like with regular mortar. We usually recommend building Rumford firebox walls straight up, but premixed mortar makes building even a curved or slant firebox a breeze because you don’t have to form it or wait long for the mortar to set up. Premixed mortar can be a little messy to use but remember it is water soluble, so it cleans up easily with water. You should butter a thin layer of refractory mortar on the firebrick that you are going to lay. Use a small margin trowel because it fits in the bucket better than a pointed trowel. After applying a small amount on the firebrick, tap the firebrick in place so that the joint thickness is approximately 1/16" and the excess mortar that oozes out from between the firebrick is removed with the margin trowel. Take your time and avoid the mess. The best thing is to lay a few firebricks and then clean up the face of the firebrick with a sponge and clean water. The longer you wait to clean up the face of the firebrick, the harder it is to get all the particles saturated and removed. In hot and dry climates we prefer the premixed refractory mortar because it does not seem to dry out as quickly as do other mortar types. Pre-wetting the firebrick helps if ambient conditions are hot and dry, no matter which type of refractory mortar is used. Even though there are some things that we prefer about the premixed products, the non-water soluble hydraulic setting refractory mortar is our first choice for all applications. In colder and damper climates, there is no question we like it better! 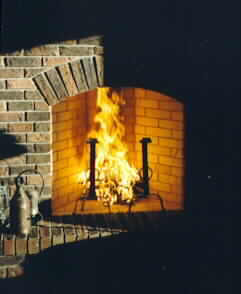 Q: How long does the installation need to set after completion before building a fire? Bob: One overnight of drying is sufficient for any installation. Q: What coverage is typically for refractory mortar? Bob: The amount of Heat Stop brand refractory mortar, either premixed or the dry mix, needed is estimated at 50 lbs per 100 firebrick if they are laid the 2 1/2" thick way and a bit more (not double) if they are laid the 4 1/2" thick way if the joint thickness is 1/16" to 1/8" thick. An additional 50lbs should be enough to set the throat,smoke chamber, and flues. To avoid waste mix small quantities at a time.